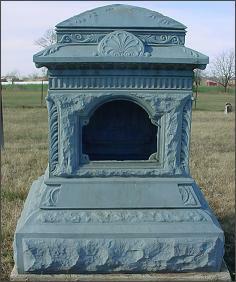 Hollow metal markers with a bluish-grey color, white bronze gravemarkers are actually cast zinc. They were manufactured by the Monumental Bronze Company of Bridgeport, Connecticut. White Bronze monuments were seldom sold locally, but were ordered by catalog through one of the company's sales agents. Company catalogs featured ads at the back encouraging people to become sales agents with "No capital investment needed." The catalog would list the various monument shapes, decorative markings, and panels which could be used. After the customer chose the overall design, the monument was cast in Bridgeport and then shipped to the customer's locale. Wax models were created, then these were used to make plaster molds for casting the zinc. A monument might be made of two or four separate panels fused together, depending on shape. All were hollow inside. Smaller inscription plates containing the individual's name, dates, or other information were bolted on separately with screws. Unfortunately, these are often damaged - plates may be removed, or the zinc screws replaced with steel screws, which can cause discoloration. The removable plates, revealing the monuments' hollow construction, gave rise to several folk beliefs about the monuments - that cemetery caretakers stored their rakes and garden tools inside them, that outlaws and robbers stashed their loot in the monuments, even that smugglers hid their liquor inside the monuments during prohibition. The fact that the monuments were catalog orders led some people to believe that Sears & Roebuck sold the monuments, but this was not the case. Because these monuments are rarely found, some people believed that a white bronze monument in a cemetery was a "display" or "demonstration" model put up by the monument company, but there is no evidence for this. The Monumental Bronze Company in Bridgeport began manufacturing the white bronze grave monuments in the 1870's. In the 1880's, the company opened subsidiaries, including Detroit Bronze, American Bronze in Chicago, and the Western White Bronze Company in Des Moines. There were also subsidiaries in Philadelphia and New Orleans. Some sources say that all the casting was done in Bridgeport, and the monuments were sent to subsidiaries for fusing. Other sources maintain that accounts are not clear as to whether casting was done at the subsidiary plants. 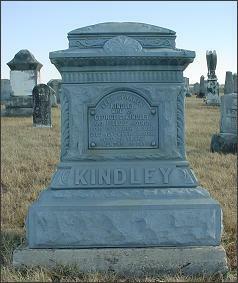 The company ceased production of white bronze grave monuments in 1912 (or 1914). It is possible to find white bronze monuments with later death dates. The company continued to make inscription plates after it stopped production of complete monuments. 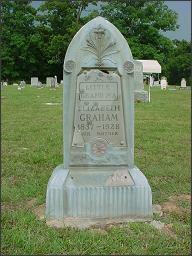 Plates might be added to previously existing monuments, as in the case of the marker of Elizabeth Graham, shown at the top of this page. Her inscription plate shows a death date of 1928, and the plate appears to be made of hard plastic. This plate is someone's later addition to an existing monument. Aside from the problems of plate removal, the white bronze monuments are usually very well preserved. Zinc resists corrosion, and exposure to the elements has formed a protective layer of zinc carbonate, which gives the monuments their characteristic blue-grey color. Castings are typically still quite clear and sharp, and do not suffer from the weathering, mosses, and lichens that pose such a problem for their stone counterparts. "White Bronze Markers," by Barbara Rotundo, Association for Gravestones Studies FAQ. Rochester's History, An Illustrated Timeline, Cemetery Monuments in Mt. Hope Cemetery (website).